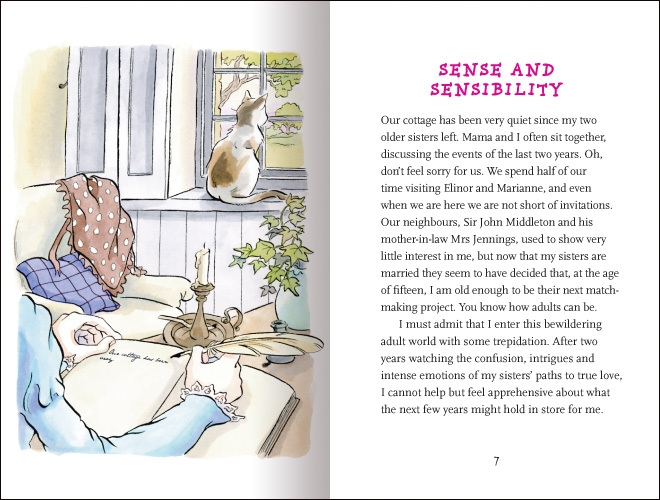 Gill Tavner’s abridged version of Sense and Sensibility makes radical, and successful, changes to Jane Austen’s novel. 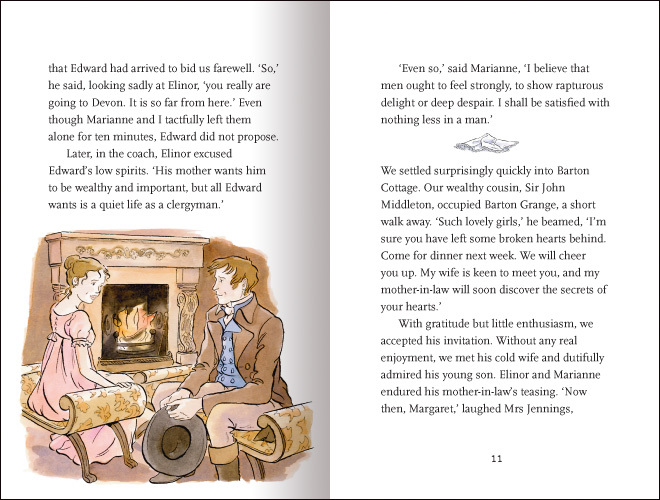 The key to her adaptation is the choice to tell the story of Elinor and Marianne Dashwood in the first person, from the perspective of their younger sister Margaret. A minor character in Austen’s novel, Margaret is close enough to her sisters to watch their romances unfold, and understandably interested to see what her own future as an eligible young woman might be. 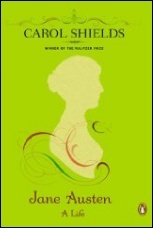 Emma Thompson’s screenplay for the 1995 film of Sense and Sensibility expanded Margaret’s role, making her a more lively character who enjoys joking with Edward Ferrars, but here Tavner makes Margaret even more central, as she becomes the main reader of her sisters’ lives and the choices they make about romance and marriage. This edition includes a brief essay about the social context in which Austen wrote Sense and Sensibility, and while many readers would argue with the assertion that “Jane Austen does not include politics in her novels,” the essay is otherwise helpful in explaining the importance of marriage and the moral code by which courtships were judged in Austen’s time, along with an introduction to the contrast between the “age of reason” and the “age of feeling.” A bibliography, a list of Austen-related websites, and a few discussion questions about characters, themes, and style complete the volume. Carol Shields’s short biography of Austen would be an excellent addition to this bibliography that’s designed to introduce readers to Austen’s life and work. If Margaret is to narrate the full story, she has to be present in more of the scenes than she is in Austen’s novel, and thus Tavner has her accompany her sisters to London when they stay with Mrs. Jennings. This is a bit of a stretch, as she would be considered too young for a London visit to be of any use to her social career, but it allows Tavner to have her witness important scenes, and the fact that Austen doesn’t send her to London is the very first thing pointed out in the section at the end on “filling in gaps.” It’s believable that Margaret would watch Marianne’s impatience for a letter or a visit from Willoughby, and even that she would happen to overhear Colonel Brandon telling Elinor about how Willoughby abandoned his ward, Eliza. And Tavner thankfully stops short of showing Margaret at the party where Marianne at last sees Willoughby. Margaret explains that she’s “Too young for a London party,” and she waits impatiently to find out what’s happening. Whether I’m reading an abridged version of an Austen novel or watching a film adaptation of one of them, I always think about the brilliance of the original, and sometimes I wonder why we seek out these reinterpretations of her work instead of just reading and rereading what she wrote. I confess there are moments at which I feel that I’m an Austen purist at heart—and I do think it’s very important to keep returning to the novels themselves, to focus on the characters and plots she created, to appreciate the subtleties of her style and her moral vision. There are now so many stories, novels, films, games, board books, t-shirts, coffee mugs, and so on, that are linked in some way to Austen’s life and fiction that it would be easy to fill a lifetime with Austen ephemera and to lose sight of the original works entirely. At the same time, I definitely appreciate the richness of the range of ways in which writers have been inspired to offer new perspectives on the originals, many (though certainly not all) of which are entertaining and wonderful in their own right. This version of Sense and Sensibility makes me think afresh about what it meant to be a young girl in Austen’s time, wondering what the future would bring. It’s an excellent introduction to the novel for young readers. Respectful, smart, and playful, Gill Tavner’s Real Reads adaptations belong with the very best of the many reinterpretations of Austen’s novels. 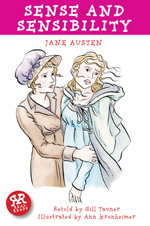 Jane Austen’s Sense and Sensibility was published 202 years ago today, on October 30, 1811. No zombies, I agree. But no movies? No “Clueless”? When it’s done well (fiction or film), it can definitely add to the experience of reading the original. Would you make an exception for any of the others? What about Lost in Austen? I love to use the classics (abridged) for my ESL students. They often have the maturity to understand the themes and plot of Austen (or other writers) as they are mostly over 15 but not the vocabulary or the fluency of English nessecary to actually read Austen. So these versions are perfect for me. I consider them a springboard into the full text for those that liked the story. That’s so interesting to hear, Anneke. Thanks very much for commenting!